Each year the Treasure Coast Chapter accepts nominees for outstanding communications achievement in the following categories: Crisis, Non-Profit/Government, Corporate, Special Event. Communicator of the Year Awards will be announced during the Image Awards Breakfast Ceremony. Congratulations Communicator of the Year Nominees 2019! Have questions about Communications Conference? 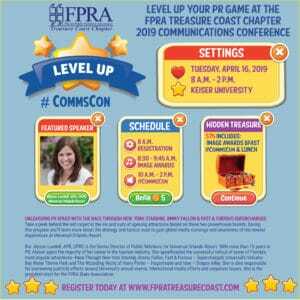 Contact FPRA Treasure Coast Communication Conference Director Nancy McCarthy, APR.